Draft script written and initial planning taken place during 1997 and 1998. Project abandoned due to budget concerns. 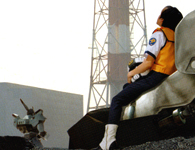 NOTE: The above image is taken from the cover of the 1998 Japanese laserdisc and DVD release of "Patlabor the movie" and is not an image from Chistophe Gans' production of Patlabor. It is in the article for illustration purposes only. In 1997, fresh from making his live action adaptation of the manga "Crying Freeman", French director Christophe Gans talked to several members in the media about his next project, a live action version of Patlabor. The initial idea came about when Gans was offered the rights to several manga to make live action adaptations of. In particular he wanted to make a live action version Patlabor. In 1993, Gans was one of three directors who contributed to the omnibus horror film "Necronomicon". The other two directors were Brian Yuzna (Gans' long time producer) and Shusuke Kaneko (director of the 1990's Gamera trilogy). The screenplay writer for Kaneko's segment was none other than Patlabor screenplay writer, scenarioist and Headgear member Kazunori Ito. This led to a go-ahead for a meeting with Bandai Visual, who accepted his proposal. According to an interview with Gans in UK magazine Manga Mania in November 1997, his version of Patlabor would have been shot in a hand held documentary style. The film would have played more like military drama or a war documentary. He explained; "It's a war movie, it's about tanks, urban guerrillas. But let's see what happens if we take the point of the view of people in the street and try to do it like a documentary. It would be great, [where as] to just try and do a science fiction movie would not do". Gans stated that he would begin writing a draft screenplay of the film during pre-production of his big budget "Nemo" movie, based upon "20,000 Leagues Under the Sea". David Allen of "Young Sherlock Holmes" and "Ghostbusters II" fame would have been brought in to do the special effects. It was hinted that these would be CGI, but David Allen was a master of stop motion animation. But in the end, the live action film of Patlabor never materialised. In a 2006 interview, Brian Yuzna stated the film was abandoned due to the projected cost of it. With Yuzna's production history of rather B-grade and low budget films, it's probably a blessing it was never made. Gans "Nemo" project never got off the ground either, due to casting problems and will probably never be made. However in the last few years he has made some notable films such as "Brotherhood of the Wolf" and "Silent Hill". Sadly David Allen died in 1999, leaving his life's work "The Primevals" unfinished. The odd thing about this whole episode is that Mamoru Oshii's live action pilot film of Patlabor was made a year after Gans announced his project. Was this to beat him to the punch or part of some sort of co-collaboration? Oddly enough Oshii's pilot film does have a "hand held" camera sequence, something Gans wanted to do with his film. A GWEI Product. ©2003 - 2018 GWEI. Patlabor image ©1998 Headgear/Emotion/TFC. All other logos/trademarks are copyright of their respective owners/companies. Used for review and illustration purposes only.